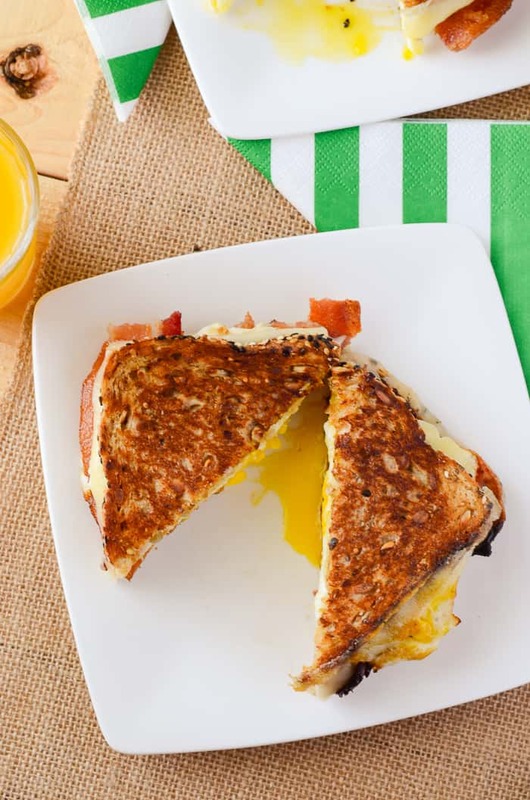 A totally perfect, simple breakfast grilled cheese sandwich, made with crispy bacon, fried eggs, and two kinds of Havarti cheese! I’m kind of a spaz when it comes to dairy, cheese in particular. Huge, huge fan here, folks. Cheddar, Swiss, pepper jack, brie, feta. You name it, and I’m into it. Except for bleu cheese – you all know my aversion to that junk. And goat cheese, but blech, that’s both literally and figuratively a different animal that I won’t even get into today. I can easily remember cheese being a favorite food of mine all the way back to my childhood. I used to sneak in to the refrigerator (when I was tall enough to reach the dairy drawer), quietly pull out a slice of yellow American, unwrap it reverently, and proceed to fold it in half and bite little holes in it and make a weird, cubist, Hannibal Lecter-esque mask that I then proceeded to wear around the house before devouring. I had quite the imagination, and luckily, lived in a house that fully supported my nonsense. Nana made grilled cheese sandwiches and soup at least once a week for dinner, and while the soup was different every time, the sandwich was always the classic version. I love being a grown up, now, so I can eat the grown up types. 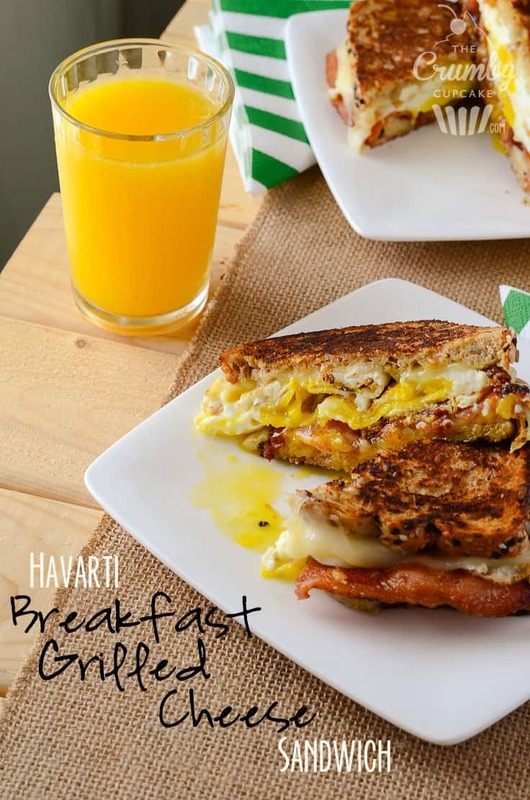 For example, this wonderful Havarti Breakfast Grilled Cheese Sandwich comes to mind, and that’s what we’re going to drool over today! Grilled cheese isn’t just for lunch and dinner, you know. When you grab a fast food breakfast sandwich, how is it normally described? Egg, breakfast meat, bread vessel, with cheese. See, that’s where this sandwich differs. This is a grilled cheese with all that other stuff. Don’t get me wrong. Bacon is just as important to me as the next guy, but don’t miss my point. We are celebrating the beauty that is the Grilled Cheese Sandwich, and the fact that we can put anything on it that we want. Which includes breakfasty toppings. In the case of this particular morning glory, I chose to start with some grainy, chewy, delicious organic wheat bread, and my favorite Arla Dofino Havarti cheese. I discovered the wonder of Havarti only a couple of years ago, when Mr. Crumby brought some home (for one reason or another), and we ended up throwing it on to turkey sandwiches as a quick dinner. I fell in love, and haven’t looked back – it has become my go-to cheese. And when I found out that we carried the Arla Dofino brand in the deli department (not dairy!) at work, I was thrilled! It’s free of added hormones, artificial flavors and preservatives, and has been crafted with quality, natural ingredients in Wisconsin for over 100 years. It’s obviously got some staying power. The Havarti transforms this sandwich, guys! I’m not even joking – it’s so soft and gooey, and the dill variety has just the right amount of dill so it’s not overpowering. And if you’re organically inclined, Eureka! makes the greatest grainy breads that pair with this sandwich. Mr. Crumby was hesitant about it after taking a bite straight out of the bag, but when the masterpiece was complete, it was the ultimate breakfast sandwich! Chewy and crunchy, gooey and slightly sweet, and absolutely filling. One Havarti Breakfast Grilled Cheese was plenty, even for a two sandwich kind of guy. Coincidentally, with all this chatter about cheese, it just so happens that April is National Grilled Cheese Month – and there ain’t no party like a grilled cheese party! What are you doing on April 8th from 8-9pm EST? Do you have a Twitter account? 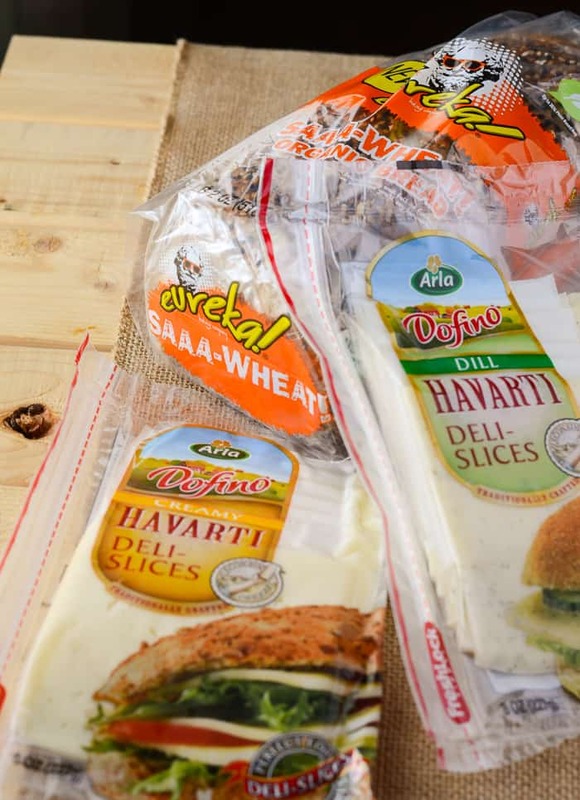 Do you want to win some amazing prizes from Arla Dofino? Of course you do! And guess what? I have an Arla Dofino prize pack of my own to give away, too! 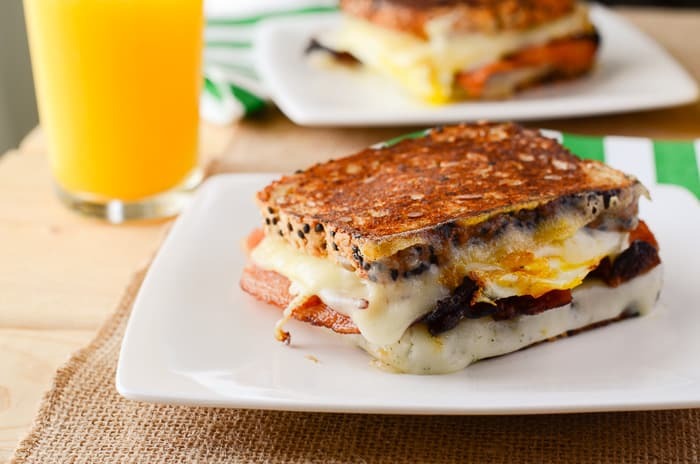 But not until you check out the recipe for this crazy delish breakfast sandwich! 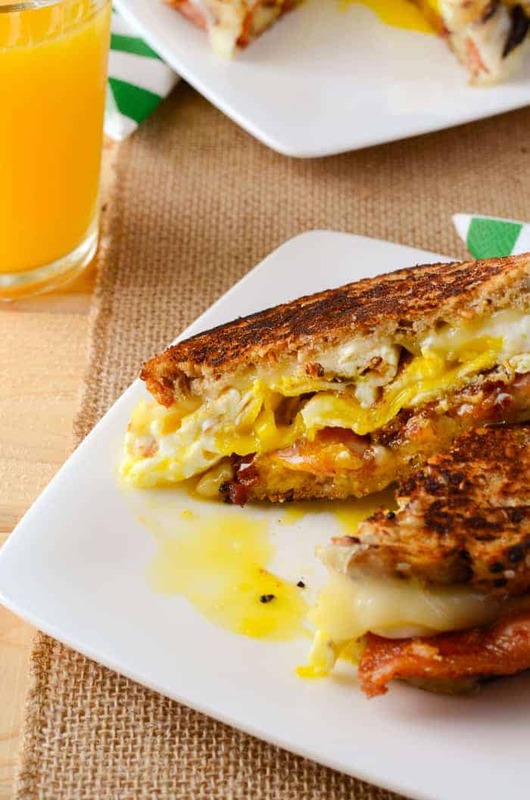 Fry your eggs and bacon; immediately begin building sandwiches while still warm! Butter one side of each piece of Eureka! Saaa-wheat! bread. 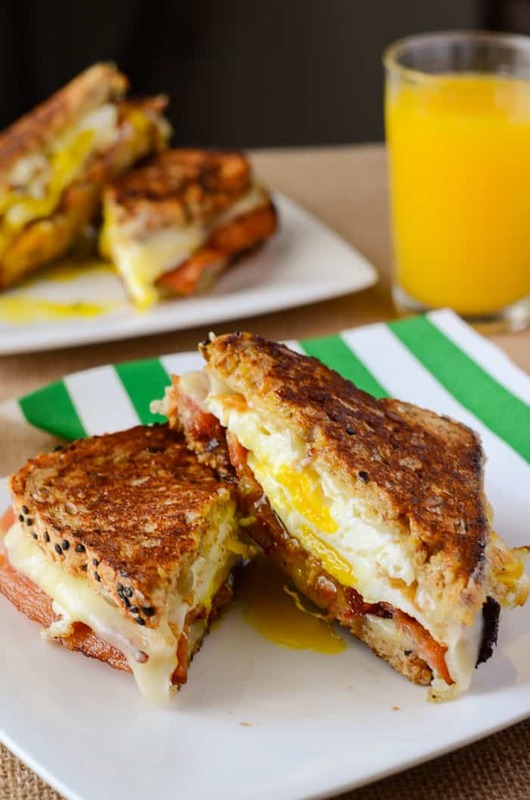 On the non-buttered side, stack the following: 1 slice Dofino Creamy Havarti, 2 fried eggs, 4 halved bacon slices, 1 slice Dofino Dill Havarti. Top with second slice of bread, buttered side facing up. Set sandwiches in a medium skillet over low heat, and cook about 2-3 minutes on each side, allowing the cheeses to melt. Plate, cut in half, serve, and enjoy! 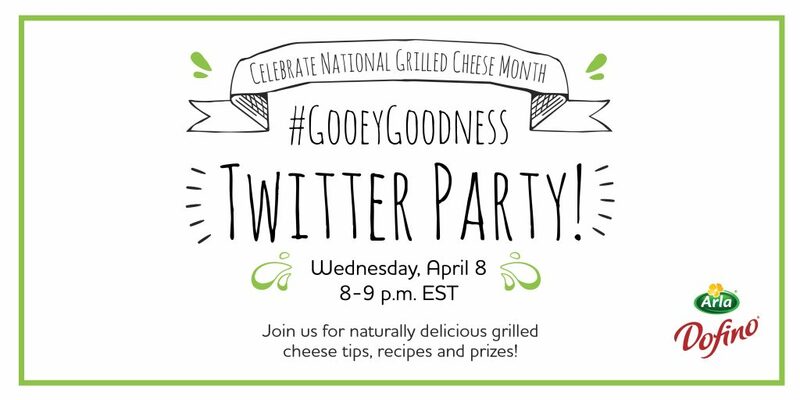 THE #GOOEYGOODNESS CONTEST HAS ENDED! Havarti is like my favorite cheese ever. This looks so good! 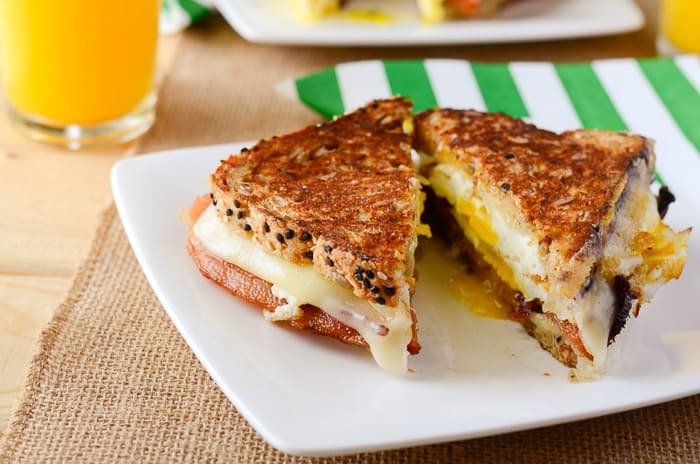 I’ve never had a breakfast grilled cheese, but I’m think I’m gonna make this over the weekend. I can’t wait! Oh my goodness, it’s so good, isn’t it?! Cheddar will be my all time fave, I think, but Havarti is just about tied for second! Growing up I was lactose intolerant. Then I went through puberty and my life changed. ALL THE DAIRRRRYYY. This looks so fab! I’m so glad you get to enjoy dairy now! I read somewhere that like 75% of the world population is actually lactose intolerant, but most people just ignore it lol. I think my hubby is one of those people…too much ice cream and he’s a goner! This looks so hearty! I Love trying new things for breakfast, and I guarantee my husband would try this! Whenever I do grilled cheeses, I add a thin layer of mayo on the bread. Adds extra melty ness! My kids really would love this, they’re really loves the cheese. Wow! What hearty delicious breakfast sandwiches! Would be perfect for a brunch party too. Thanks for some awesome recipes!!!! Wow this is just delicious looking! What I would call a breakfast I would love to have every nothing! Yum looks great! i can’t even describe how good this looks to me: havarti cheese…bacon…I had to pin this for later! You totally had me at havarti! Love that awesome stuff! This is such a genius idea. I always struggle with coming up with new and creative breakfasts that take little prep and that my boys will actually eat! I like Havarti too. Your sandwich here really does look oh so yummy delicious. That grilled cheese looks so good! I’m tempted to make it now for breakfast. YUM! That sandwich looks great! I admit I haven’t tried havarti cheese before, but this has made me want to! Oh, it’s SO worth trying! It’s mild but super tasty! I hope you end up loving it, too! Bacon is one of my weaknesses! This is definitely a new breakfast food I want to start treating my family to. Oh does this looks so delicious right now. I am so hungry for this after seeing and reading the recipe. This is a perfect breakfast indeed. Thanks for sharing. Ummmmm this sandwich looks absolutely delicious!!! I need to make one of these for myself. Definitely giving this a pin!!! Too yummy! I have had this cheese before. It is amazing. Nice and creamy. yum!!! I love breakfast sandwiches!!! Pinned this, so tasty!!! Oh em gee, this looks amazing! Havarti is one of my favorites! Hahaha Im still laughing just imagining you with your Hannibal Lecter cheese mask running around the house! Anyway, I wish this grilled cheese was my breakfast today. It looks relish! One unique way we like to make grilled cheese, especially for breakfast, is to use two pieces of french toast as the bread. It tastes sort of like an omelet. I combine cheese; cheddar, havarti, mozzarella and provolone is a favorite too. Layer of melted cheese is delicious! I should have eaten breakfast before seeing this because now I am STARVING for this sandwich! It looks and sounds absolutely delicious. I recently discovered I have a dairy sensitivity so I save any dairy indulgences for really GOOD cheese, and Havarti is definitely at the top. I’m actually judging a grilled cheese competition this weekend and your post is just making me even more excited! Grilled Cheese FTW! The store locator link does not work.